This version: Half-circle with custom stand. Debuts with the Atlanta Hawks Pro Basketball Team at the Phillips Arena, in Atlanta Georgia. Half-circle (180 degrees of keys), optional mount (pictured) for control surface. 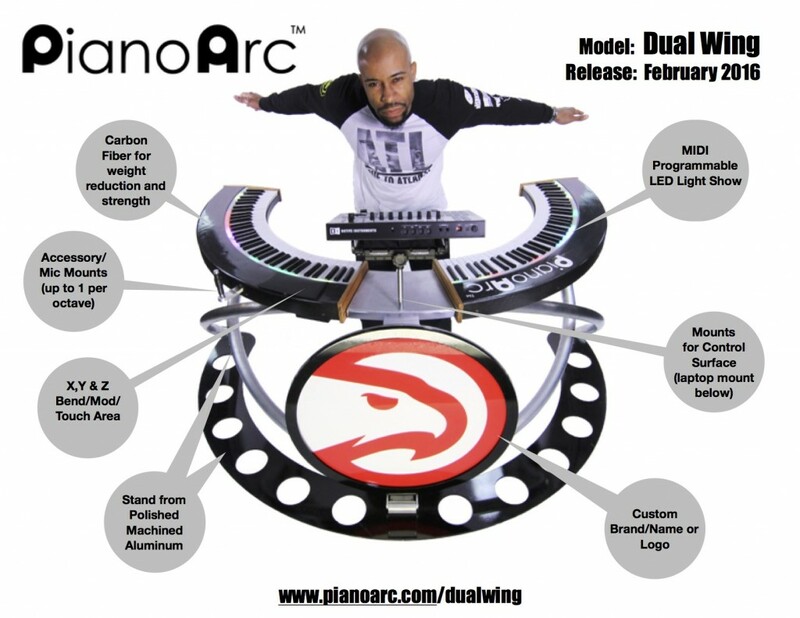 144 keys from dual 72 note sections, with integrated LED -MIDI programmable light show. Our new SuperG “brain” box for connections and program/presets. 12 pedal inputs, single Compliant USB out. Touch “Z” Pad featuring X, Y and Z (depth) sensing. Custom finish tops and keyslips. Custom machined aluminum “swooping” stand that includes custom mounts for control surface, laptop and additional mic mounts. To learn more about pricing or purchasing a Dual Wing – please submit a quote request or if just curious send us a note via our Contact page.